De Waal Wines has such a great history in Cape wines. Pinotage being the focus as not only was the first maker in 1941 of a barrel of Pinotage Charl Theron de Waal born in the Estate’s Uiterwyk Manor House, but also, the Estate is home to the oldest Pinotage vineyard in the country – and the world! 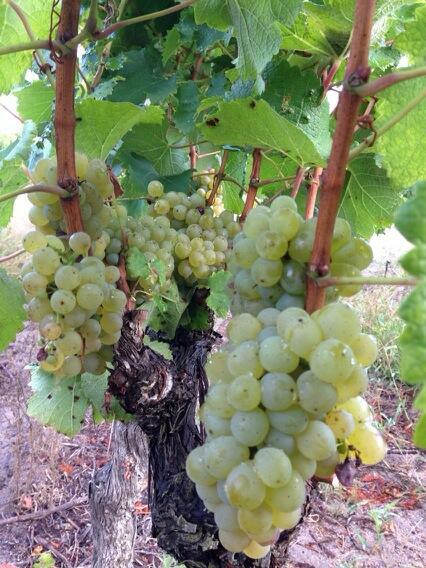 However, they are not shy when it comes to the DeWaal Young Vines Sauvignon Blanc 2016. I am always amused that they call their wines Young Vines, particularly as the vineyard from which these grapes come is between ten and a venerable 15 years old. So much the better for the flavour of the wine. Planted on Hutton soils on the farm’s higher south facing slopes, the vines are trellised an offer forth an even handed 9 tons per hectare. In the cellar the wine is classically made with a period of 10 to 14 days’ fermentation and maceration. It has a lowish alcohol at 12.7% which makes it a great summertime wine. On January 28th, The Top of The Hill Fun Walk starts up again in the middle of the harvesting season. 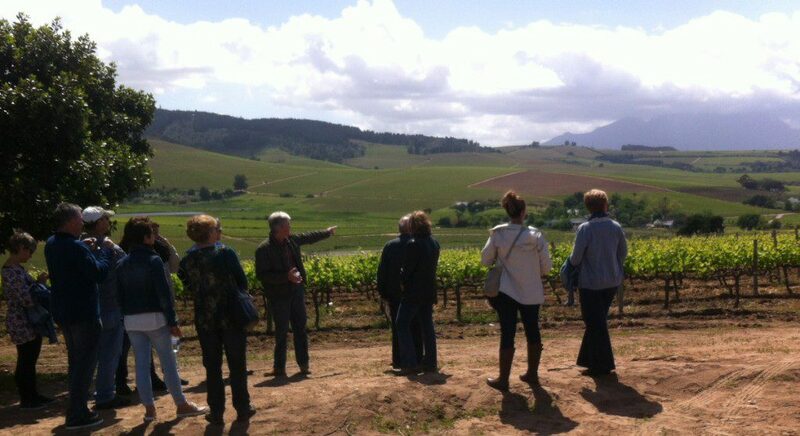 You are invited to join owner Pieter de Waal on a walk to this historic vineyard. Meet at 09h45 at the Tasting Venue, the Walk commences at 10h00. It goes through the farm and the many rows of vineyards to the shade of a magnificent Old Wild Fig Tree, a landmark on the farm and based next to the old Pinotage vineyard block. Here you take a short break, as this is the perfect spot to taste the Estate’s flagship wine – Top of the Hill Pinotage 2014. Interestingly this wine was selected in an Italian book in 2015 as one of the “1001 Wines to Drink at least once in a Lifetime”. Included with the Top of the Hill Walk is a tasting of the De Waal range, a lovely selection of local cheeses and delights on the outside Terrace and a glass of DeWaal wine. Reservations: Please make reservations 48 hours prior to the Fun Walk. Please note: This event is weather-permitting. For more details and reservations, please contact Helga. Email: admin@dewaal.co.za | Tel: 021 881 3711. Packed under screw cap in a Bordeaux shaped bottle, appropriate for a grape which originated in Bordeaux. In the glass a gem bright twinkly pale gold straw. Sweet tropical fruits, crisp apples and fynbos herbaceousness. Crisp and fresh fruit. Soft granadilla acidity, ripe guavas and desiccated pineapple. Zippy ending packed with flavour. Summer time quaffer as a mid-morning refresher and excellent with food. 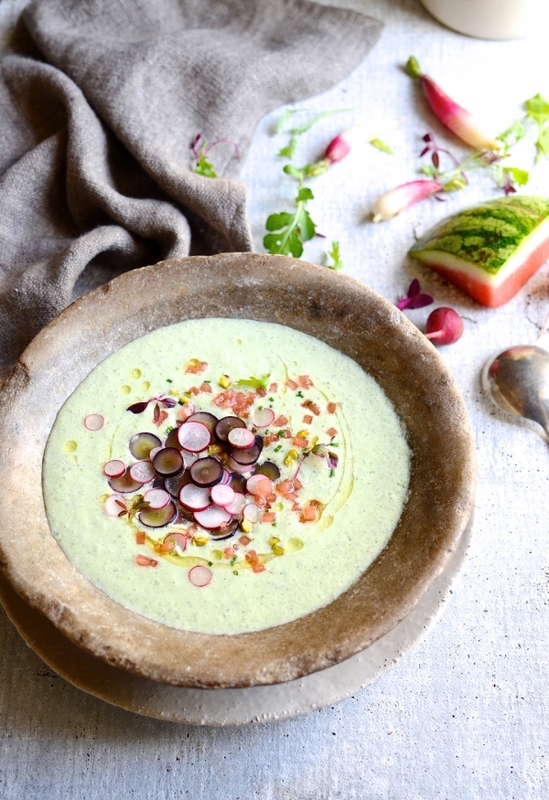 Dianne Bibby’s Chilled Cucumber Soup with Grape & Watermelon Salsa is an excellent partner, in counterpoint to the rich creaminess of the soup. Click here for her recipe.